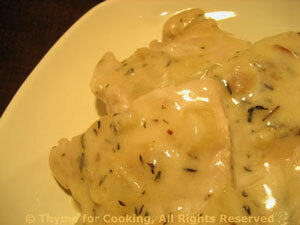 Turkey Cutlets, Tarragon Wine Sauce, Thyme for Cooking gourmet main course. Heat oil in medium nonstick skillet. Add onion and sauté about 5 minutes. Add tarragon, mustard and white wine, reduce heat and simmer, covered, 10 minutes. Spoon sauce over turkey and serve..